Wanting to join in on the space race, but too concerned about the cost it’ll have on the environment? If this is you then Pear Comp and Electronic Arts have got you covered. If this isn’t you, what may be more likely then is that you are after a casual game that is simple to play yet highly addictive and visually stunning. If this scenario applies more to you than the first, then Pear Comp and Electronic Arts have definitely got you covered with their latest, Draw Jump. 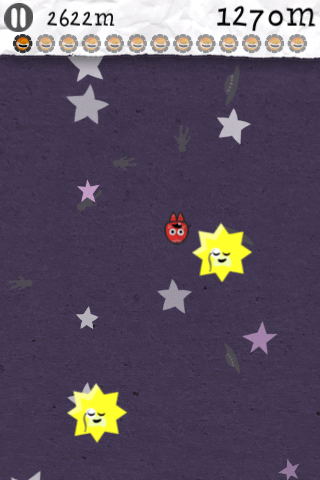 Draw Jump features a little eco-friendly rocket man by the name of Cosmo. Your job is to help Cosmo attain his ultimate goal of flying through space with minimal cost to the environment. To do so, all you need to do is a draw. Drawing trampolines will launch Cosmo into the sky and upwards into space. Along the way collect sunflower fuel cells to give Cosmo that little extra boost. The basic gameplay of Draw Jump seems simple enough, swipe your finger on the screen to draw a trampoline that will lunch Cosmo into space. While at first this is a simple task, with Cosmo generally jumping straight in the air, you soon encounter obstacles on your flight into space. The first objects you come across are helpful little sunflower fuel cells. 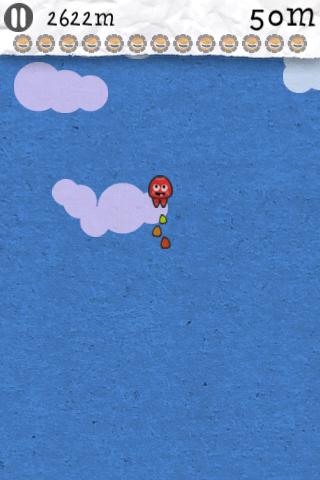 After collecting a number of sunflowers, Cosmo’s eco-friendly rocket is powered up and he blasts off into the atmosphere. 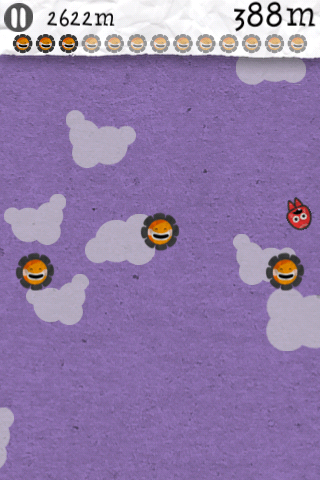 In higher levels more obstacles appear such as suns that can hurl you in any direction or spinning items that can knock you back down to Earth. Really, the only thing left to say about the gameplay is that it is incredibly addictive. I’d put this down to a simple concept and action, swiping across the screen, which is easy to learn. That being said, to master Draw Jump can be a more difficult feat, factoring in the angel and size of your drawn trampoline in order to avoid obstacles or collect your much needed sunflower fuel cells. When I heard the name Draw Jump, I can’t help but think of the number of “doodle” themed games that litter the App Store. Scribbly little characters bouncing around on a sheet of grid paper, attempting to avoid equally scribbly enemies, or whatever story suits the “doodle” theme that matches the title. After first opening Draw Jump, I found that the word “doodle” or even “draw” didn’t suffice as an adequate description of the visual complexity I had just seen. After happily clicking “play a game” I was completely captivated by the complex layering of collage elements used to create this brilliant interactive scrapbook. What is even more impressive is that the higher Cosmo climbs, the more visually complex the levels become. Starting with a blue background, progressing into the clouds, the background turns darker as Cosmo reaches further into space. Despite being completely two-dimensional, there is an incredible amount of depth in the design of the levels. From quirky little sunflowers, to opaque space ships floating almost unnoticed in the background, there is a real sense of detailed structure to Draw Jump. 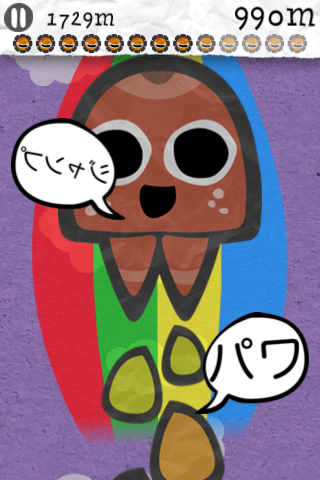 Like the graphics, the background music progressively becomes more complex and more layered the higher you fly. Starting from happy little down to earth chords, transcending into complex beat filled mixes, the soundtrack really stands out and encompasses the rise of Cosmo into space. Not to mention the enjoyable little sound effects that you encounter on your way up. A personal favourite of mine is the rubber sound from when you draw a trampoline for Cosmo to bounce on. This works on two levels, firstly that you are creating something squeaky and bouncy to launch your little friend into the air and secondly because it seems to acknowledge the actual interface which you are connecting with: the iPhone screen. 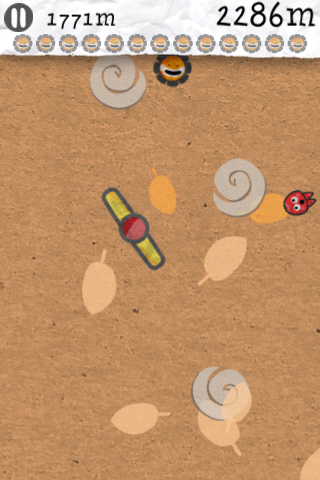 It’s little details like this that make Draw Jump such an enjoyable adventure. From visually rich levels to progressively complex music and game play, Draw Jump is, in every sense, an incredibly fun and addictive game. If you are into casual games and want something to pass the time while on a bus, or even just want to sit back and relax and play for an extended period, I would recommend Draw Jump for either situation. While there are a lot of similar jumping titles out there for iOS, I don’t feel like any have really hit the nail on the head as hard as Pear Comp and Electronic Arts have. I am a current media student with a focus on video game research.